Sambal belacan is pungent and delicious. This paste is used a condiment or sauce for many Malay or Nyonya dishes including curries, vegetable stir fries or salad (kerabu). I have already posted two recipes for sambal belacan previously on this post (raw) and this post (cooked). Because I love this condiment so much I am going to repost the raw version with a slight change of recipe. To eat as a condiment, sambal belacan is delicious on its own or with a squeeze of calamansi lime (limau kasturi) or normal green lime. Another delicious way with sambal belacan is mix with mashed ripe tomato, some lime juice, pinch of salt and sugar. 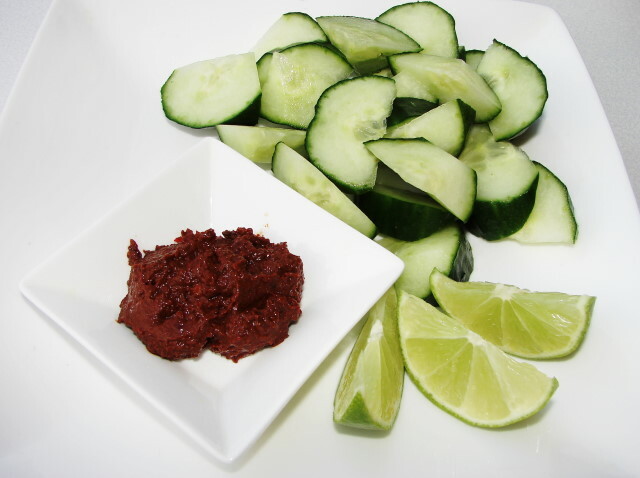 This sambal mixed with lime juice or mixed with tomato is great eaten as a dip with cold cucumber, pineapple pieces or other crisp vegetables. I once forgotten a tub of sambal belacan in the fridge it must be sitting there for about 3 months. I was surprised to find it was still smelling and looking good. I ate this and not had any funny tummy. 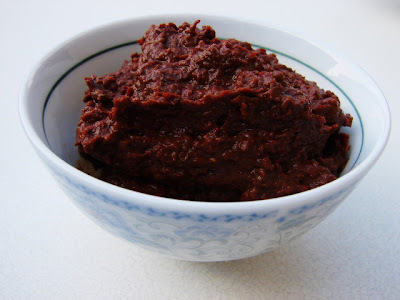 Sambal belacan paste is very concentrate, use sparingly. This recipe here will last me for few weeks. De-seed and remove stalks from dried chilies. Soak till softened. Cut into small pieces. De-seed (not bird eye) and remove stalks from fresh chillies. Cut into small pieces. Cut the belacan into 3 - 4 mm thick slices. Dry roast in a frying pan for about 10 minutes. Best do this outdoor or a strong pungent scent will linger in your kitchen and other rooms for days. Another way to reduce the smell is spread the belacan on large piece of foil then wrap this up like an envelop, prick the foil to allow steam to release. Put this foil envelop on naked flame (low flame), on a bbq or hot griddle pan and slowly roast the belacan envelop turning every few minutes, grill this for about 10 - 15 minutes. Leave to cool before opening or the smell can be a bit too strong. Put all the ingredients in a mini blender and blitz to a smooth paste. keep in clean glass jar or plastic tub. The paste will keep for many weeks in the fridge.